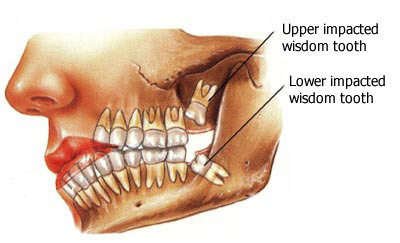 To start of lets first familiarize ourselves with the term “wisdom teeth”. What are your wisdom teeth? 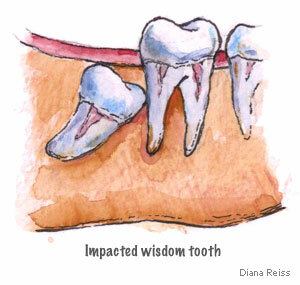 Your wisdom teeth are your third molars. They usually come in around the ages of 15-25. Since these teeth come in around adulthood they are wiser then the other teeth, thus far getting it name as “wisdom teeth”. Pretty interesting right? Thats as far as it gets, you’ll find out shortly why. Now that you know what you wisdom teeth teeth are, you should know that they can be extremely painful. Why is this well continue reading. In the long run you will be grateful when your wisdom teeth have been removed. Also you benefit in many ways as was just discussed. When determining just how long this removal process will be is based on the growth of the wisdom teeth. How developed it is. A very good reason for getting early extraction, so you not waiting to late to get them removed. This also can cause problems such as, nerve damage and many more complications. How to reduce the Wisdom tooth pain?